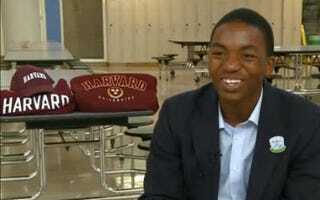 David Boone, who "gradually became homeless" after gang violence separated him from his mother and sisters, is beginning his first semester at Harvard this fall. As a junior, I began considering college. My principal had given me Ron Suskind's book A Hope in the Unseen, about Cedric Jennings' journey from the inner city to the Ivy League. That story gave me the courage not only to apply to college, but also to aim for academically rigorous schools. With a lot of support from Minds Matter, a weekend mentoring program I attended, I applied to 23 schools in total — universities as far away as Harvard, Yale and Princeton and as close as Cleveland State. I had my heart set on MIT, which is why my confidence was shaken when I didn't get in. With all that I've experienced, there has been a miracle: During my most challenging days, caring people have come along to lend me a hand. One day, I'd love to return to that favor.